Sea turtles are among the most ancient species on this planet. Today there are seven species of sea turtle remaining that date back 110 million years, back to the age of the dinosaurs. 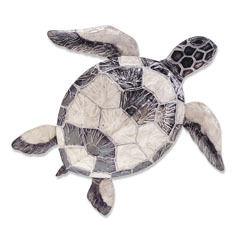 This piece features the Loggerhead turtle, one of the most recognizable of all the sea. This creature is known for its scaled skin, which the artist carefully etches into the metal of the turtle�s head and throughout the tips and edges of its body. The shell of the turtle glistens which the artist recreates using capiz shell. 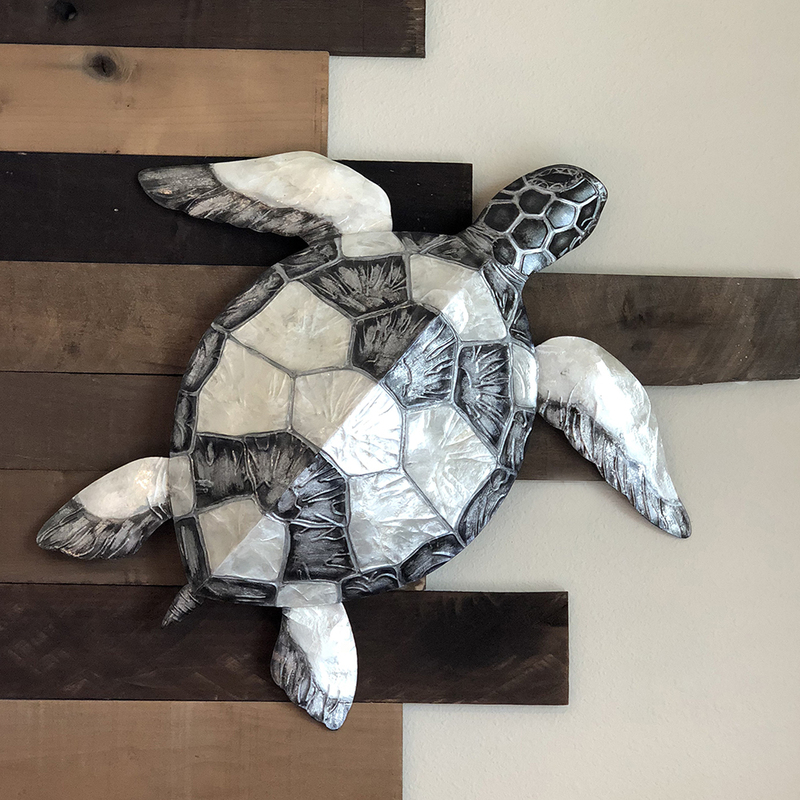 The focus of this awe-inspiring piece is the texture and size of sea turtles and the artist uses contrasting colors to underscore this fact. The basic frame of the turtle is created using tin, which is powder coated with a black finish. The frame is reinforced using tin wire along the inner edge. Capiz is an oyster shell and the primary purpose of the oyster is as a source of food. However, the by-product, the shell, can be used for decoration. Due to it being a natural material, the natural colors of the capiz come through as tans and browns underneath the paint. The shell is then painted the bold colors you see. 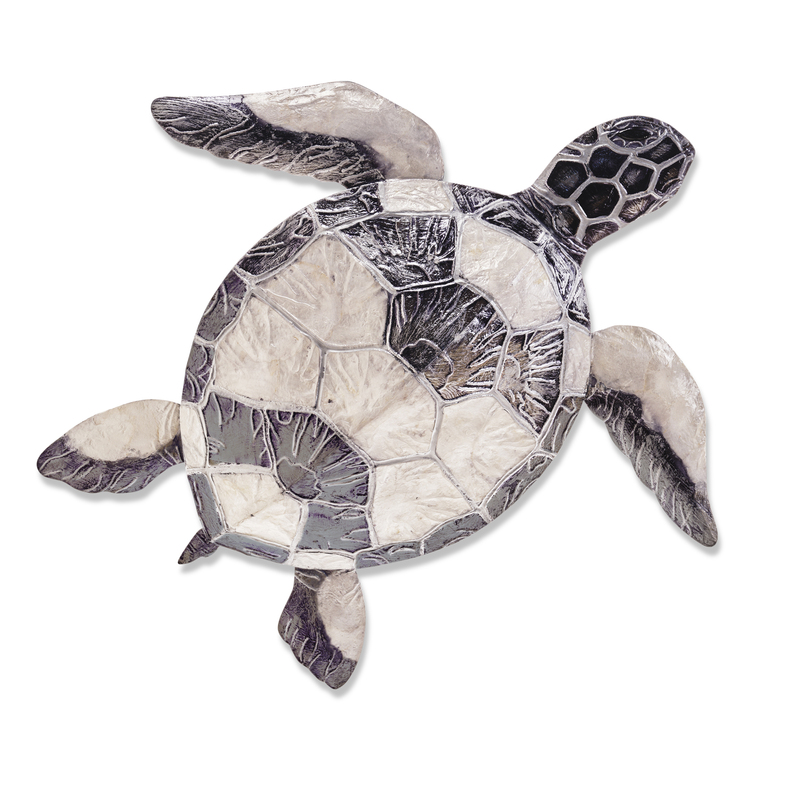 The entire front facing piece is carefully hand-painted keeping in mind the reflective qualities in the color of turtles.